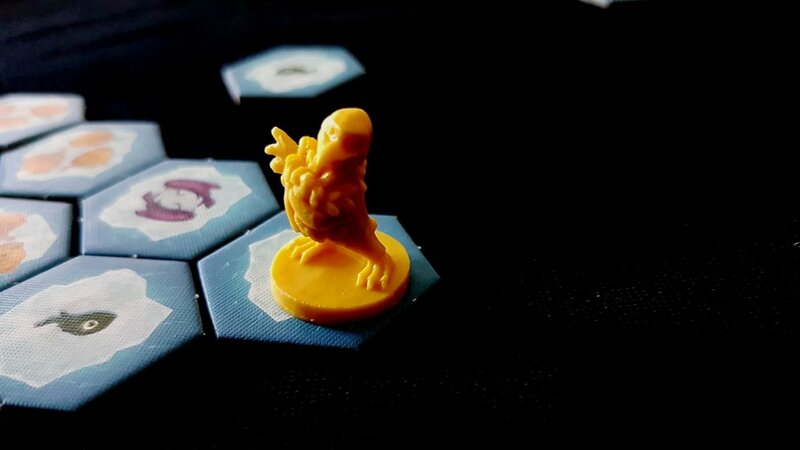 Hey, That’s My Fish suffers from having an appalling setup to play time ratio and it’s one of the things that made us offer it an admittedly miserly two and a half stars in our review. It’s actually a decent enough game, but in order to nudge it upwards in our rating you’d need to have a dedicated board-game sommelier available to gently break it down and build it back up again after every round. Most of us don’t have that, yet, so we have to rate it based on our real world experience. If you could only get the fun stuff without the setup, it would receive a review expressed with a more generous spirit. These are the kind of issues that impact on all gamers, but this additional hassle is something we need to look at too in terms of how the game presents itself to people with accessibility considerations. So, let’s dip our toes into the water and find out… oh God no, let’s not do that. Oh my God it’s so cold. It’s SO COLD. Let’s just get on with it while I try to light my feet on fire to fight the frostbite. Colour blindness is going to be an issue, but it’s one that can be somewhat haphazardly addressed within the context of the game itself. Each player has between two and four penguin markers, and all four of these have a different visual design. Every player shares the same set of four moulds, with colour being used to differentiate them by player owner. 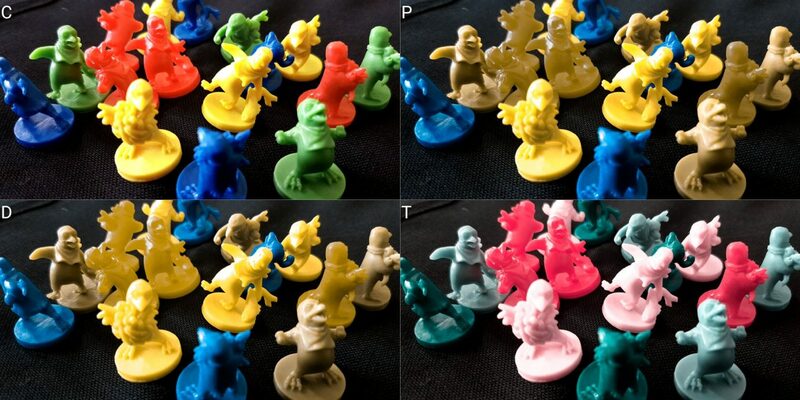 For many players, even those with colour blindness, even those pieces with overlapping colour palettes remain mostly possible to discriminate in good light and optimal conditions. It’s not necessarily easy and will be subject to mistakes, but the specific tones used for the pieces seem to offer some degree of differentiation. 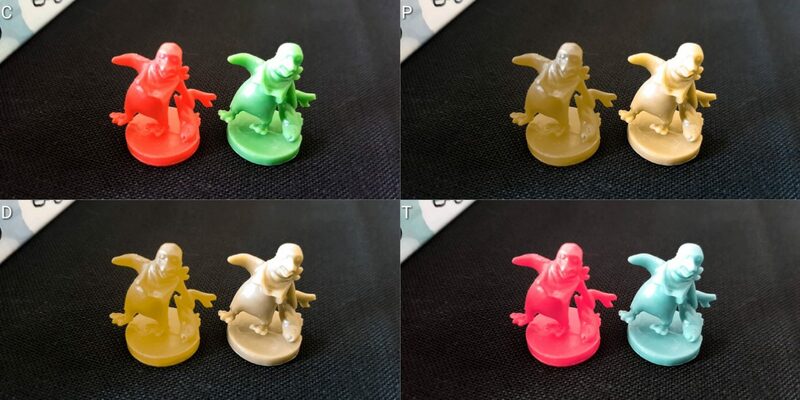 Since each player has four different penguin moulds available it’s usually possible to find some combination of player colours and pieces that works for the table, provided only one of the standard colour blindness conditions we discuss must be considered at a time. With two players, you can pick a pair of colours that don’t overlap – you use all four penguins each in that circumstance. 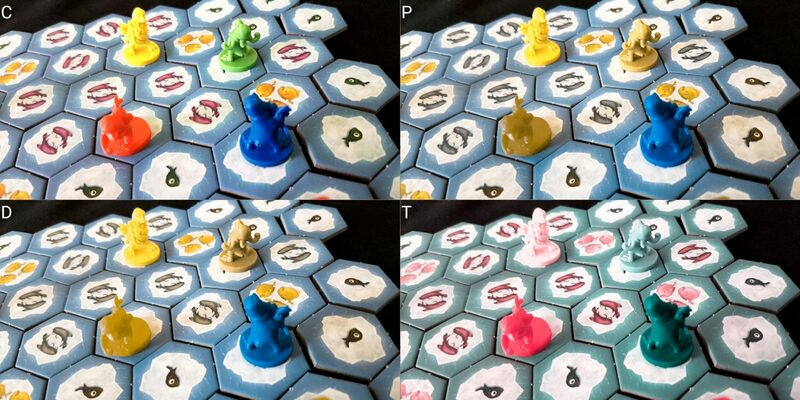 With four players you each use two and it’s possible for players of clashing colours to choose different penguin moulds for ease of differentiation. This isn’t ideal, of course, but it’s certainly a possibility for most situations. In the end though the penguins are only used to indicate position. If this strategy does not suffice it’s possible to use replacement alternate markers. You lose a not insignificant portion of the whimsy of the theme in doing that, but the game is playable. We’ll recommend, but only just, Hey That’s My Fish in this category. For those where total blindness must be taken into account, this is yet another game that is all but entirely inaccessible. All the key information needed is visual, and there is no feasible way for players to verbalise or narrate the game state or game activity in a way that would make it playable. The board is well contrasted and if playing against a surface where gaps in the tile layout are easy to make out, you can ascertain the shape of the terrain reasonably easily. The presence or absence of tiles too gives a tactile indicator that can be useful in cases of ambiguity. The edges of the tiles can serve as markers for counting along straight lines. 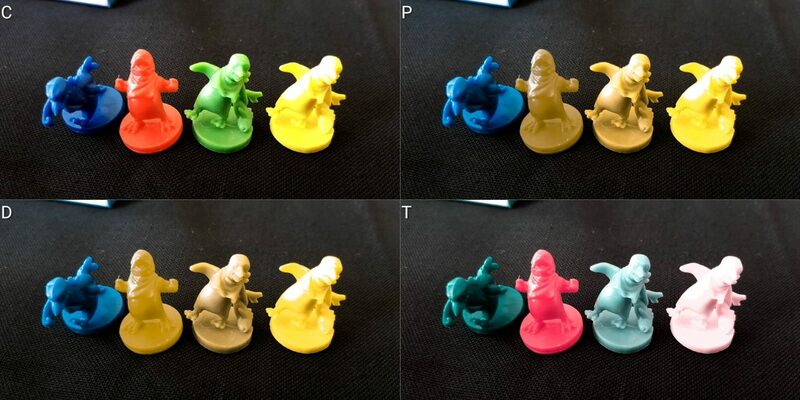 Different colours are used for different fish counts, so if visual impairment is mild the game should be playable with some support from the table. Individual player markers are large and chunky and vibrantly coloured. Those with minor to moderate visual impairments will most likely be able to make out their position on the board although the nuance of what the location means is more difficult to ascertain. 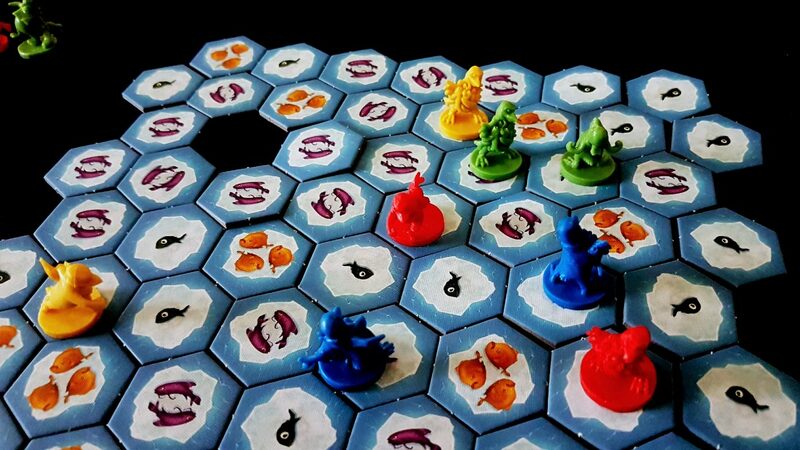 Let’s say we’re the red player – our task is to either eat as many fish as we can or attempt to parcel out a portion of the game area for our exclusive exploitation. Each of our two penguins can move in potentially six directions (assuming they’re not blocked) and as many tiles as we like in a line. That gives us a potentially significant area over which we can roam. That’s not by itself necessarily a deal breaker in this section – it’s a lot of ground to examine, but not so much that it’s impossible. The problem is in working out which move is likely to be best because that’s going to be based on the options we leave behind us for the other three players. It’s not as simple as ‘head for the largest fish count’. The move we make is directly related to the moves it opens up, or closes off, for other players. We might move our top penguin three spaces off to the top left for example, knowing that it blocks off a path for yellow or blue to get past us. That’s going to depend on whether green is going to enter that region from the other side. 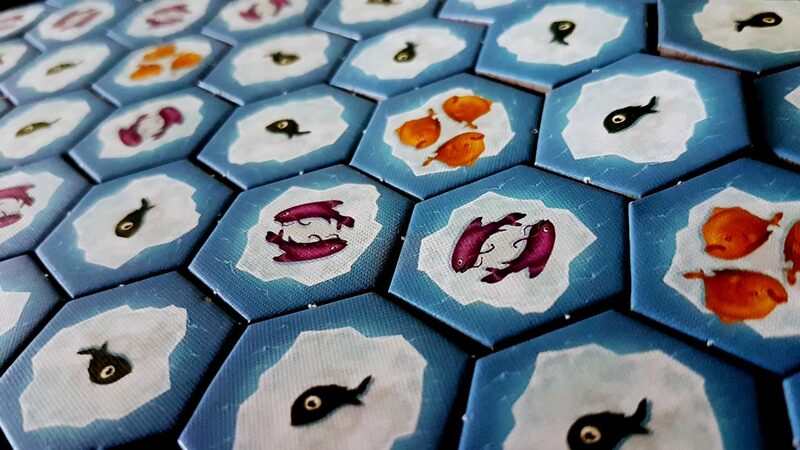 We might want to move our bottom penguin one to the left to take that three fish tile, simultaneously separating the two blue penguins. Maybe we want to move away from where all the action is, and down into the rich fishy waters of the bottom left. All of those are going to change the shape of the board by our absence and our presence, and the implication of that is much easier to work out visually than it is mentally. It’s certainly not that the game isn’t playable for those with moderate visual impairments if someone really wants to make the effort, but the effort is considerable and likely seriously deleterious to game flow. As such, we don’t recommend Hey, That’s My Fish in this category. The rules of Hey, That’s My Fish are about as straightforward and accessible as they can be. Pick a penguin, move it somewhere, collect the tile. That’s unlikely to be an issue for the majority of players, even when taking into account relatively severe cognitive impairment. However, as is heavily implied in the section on visual accessibility, effective play in Hey, That’s My Fish is dependent on being able to see opportunities to leverage penguin motion to block other players. The larger the number of players you have, the more complicated that becomes. It’s easy to be locked away from good scoring opportunities – either through your own misadventures or through the opportunism of your opponents. If you want to play this game well, you need to be mindful of the implications of every move you make – you can trap your competitors if you’re careful, but you can trap yourself if you’re not. That’s cognitively expensive in both categories we address here since it requires a mental model of the impact of each possible move and how it alters the possibility space of everyone else from that point on. This isn’t a game of chess though where you have to think many moves in advance – this is a game where you have to react to the board in front of you rather than execute upon some over-arching masterplan. Nonetheless, processing how to best leverage your remaining penguins is cognitively costly. 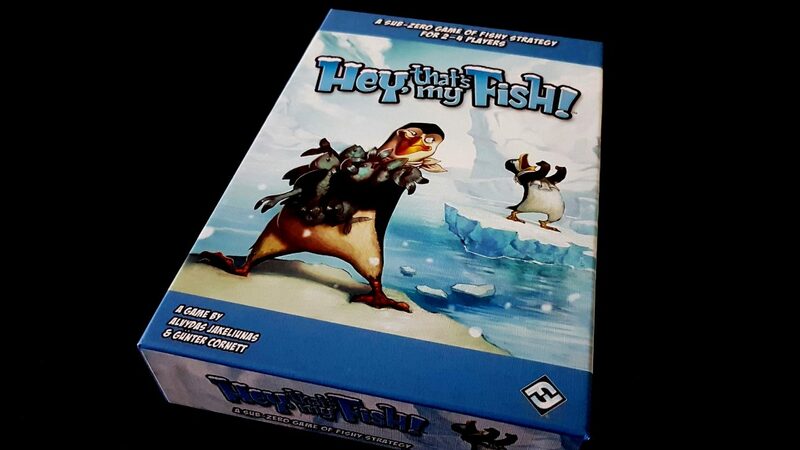 There’s a lot to be said about Hey, That’s My Fish as a kind of light-hearted simulation of chaotic movement – an unexpected play from an unexpected quarter can be just as effective at throwing people off the rails as a master-stroke of planning. Often in such cases you’ll bumble into a trap of your own making and end up losing a penguin or more. Sometimes though you’ll clean up because you’ve just changed the state of the game in a way nobody had anticipated. As such, it’s possible to play a fun game of Hey, That’s My Fish without stressing the competitive aspect of positioning and isolation. It’s even possible to simply base scoring on tiles gathered as opposed to fish gathered to ease the competition a little. That’s a more cognitive accessible variant of the game, but it does lose out on some of those elements that make play compelling. There’s an expectation of some numeracy at the end of play when scoring comes around, but that’s easily handled by the table as a whole and not necessarily a burden on any individual sitting there. There’s no requirement for literacy, no complex synergy of play, and no emergent complexity of game state to consider. We’ll tentatively recommend Hey, That’s My Fish in the fluid intelligence category with the proviso that adjustments to the competition and culture of play will be necessary to sand off some of the rough edges. Play it as a comedy penguin drowning experience rather than a game of tactical positioning and you’ll be on the right lines. For memory conditions only, we can be somewhat more firm in a recommendation but again it’s going to depend on making a few adjustments to play. There are problems across the board here unfortunately. The setup is time-consuming and tedious, and requires a fair degree of fine motion control to position hexes in alignment with each other. It’s possible to separate these out a bit but it’s difficult enough to maintain alignment without adding the difficulties of variable spacing into account. With best will in the world, it’s not going to be possible to accurately space the hexes out and maintain clarity as to how they relate to each other over a large grid. There are some player aids available on Boardgamegeek to address is but as is the normal case we assess the game as it comes out of the box. Even with the use of these aids, it doesn’t eliminate the problems. During play, it’s necessary to pick up tiles once they’re vacated by pieces, and if you’re using a tightly aligned grid for this it’s difficult to pick them out without seriously impacting on the alignment of what remains. The result is that it’s very easy for hexes to become unmoored and the whole arrangement to become raggedy and difficult to accurately assess. This is solved to an extent by spacing out the elements, but as you can see from the image above even when they begin tightly nestled together they lose clarity of relationship as time goes by. You can in most circumstances work out where they’re supposed to connect but the lower the accuracy of placement and flipping becomes, the more likely the game state transitions towards accumulated uncertainty. A single jerk of the fingers can render the entire game state difficult to reconstruct. Our usual remedy in these kind of situations is to address verbalisation, and again we don’t have a clear regime we can adopt. Penguins are differentiated by mould, but there’s no co-ordinate system in place that permits for easy referencing of locations. It’s possible to get around this, perhaps using a number code and descriptive labels for penguins. For example, ‘Move Runny Penguin six spaces along the third edge of the hex’, but that’s not going to be convenient or particularly conducive to game flow. We’ll tentatively recommend Hey, That’s My Fish in this category. Well, most of what you do during the game is arrange circumstances under which penguins get dunked into the freezing cold of the Antarctic ocean. If you’re lucky, those penguins will belong to other players. 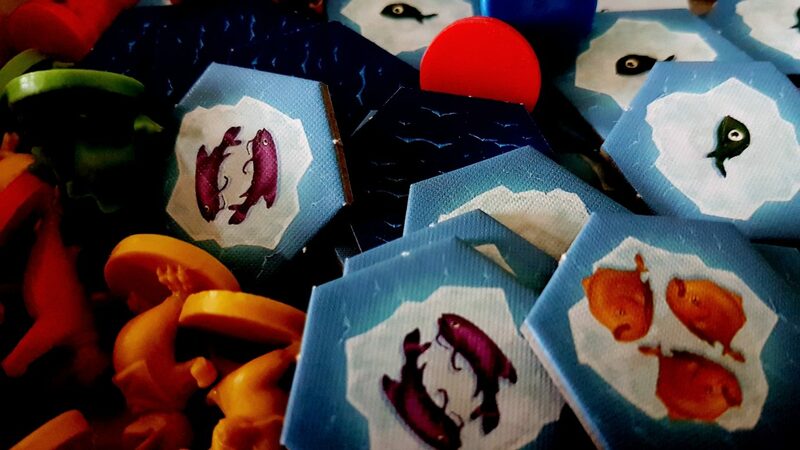 If not, they’ll belong to you – most of the game is an exercise in tactical positioning so as to cut players off from fish sources so as to permit you to exploit them without competition. As such, there are a number of issues that manifest within the game design. For one thing the game incorporates player elimination as a core element of play. For another, it incentivises players to gang up on others – it’s difficult for a single player alone to isolate someone and set them adrift. It requires at least some degree of emergent cooperation. A player in a weaker position will in many ways attract negative attention to themselves. Like bleeding out in shark infested waters, nothing has to be formally co-ordinated before a feeding frenzy begins. The nature of territorial erosion by itself is enough to make someone a repeated target of aggression when the terrain dictates it. While there are no formal ‘take that’ mechanics in the game, the core game loop itself is built upon the idea – you might move somewhere innocuous only to find two moves later that you are left with only a single tile left to send your sole remaining penguin. And specifically, that’s the case because one or more players saw the way to block off your participation in the rest of the game. A single player’s move can be a ‘take that’ all of its own. Coupled to this is that there’s no opportunity for players to undo mistakes – the grid disappears beneath them as they move. Score disparities don’t tend to be particularly high at the end of the game, but it’s certainly possible for poor initial placement and cunning opponents to knock you out of the running, and the game, before you accumulate a double digit score. Sometimes you know it’s coming and can’t even do anything to fix it. In a game this short that kind of thing is not usually a major issue, but Hey That’s My Fish is a pain in the back hole to set up each time. There’s an additional frustration – you don’t get to leap back in and even the score for the next match up. You need to navigate an enthusiasm gap between ending one game and getting it set up for the next. Much like a poker player leaving the table after a big score, there might be some negotiation required to give people a chance to win their metaphorical money back. 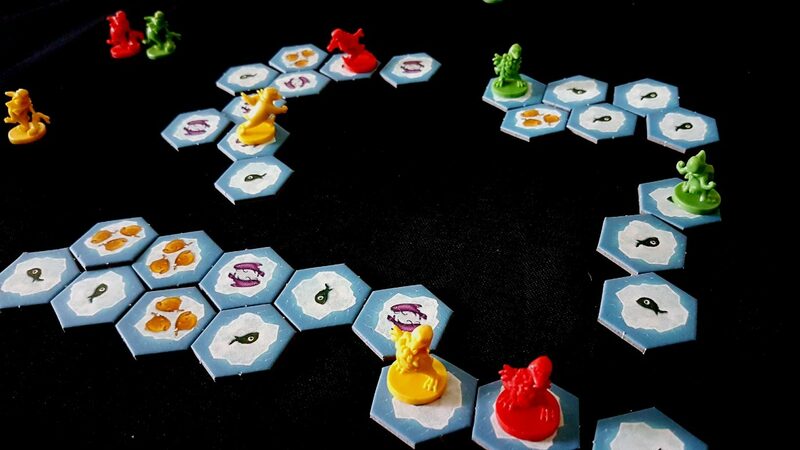 We’ll still recommend Hey, That’s My Fish in this category but bear in mind that it can be difficult to see the fun if you need to spend ten minutes setting up only to be knocked out in two turns of play. Not everyone is going to have the same opportunities to enjoy themselves when this is laid out on the table. The art in the game is based entirely around penguins and fish, so there aren’t a lot of worries here. The manual, such as it is, defaults to male pronouns in descriptions of play and that’s always aggravating. Otherwise, a clean bill of health. As to cost, you’re only going to pay around £10 for a copy of this, and perhaps even less if you find it in a deal. It cleanly supports between two and four players and is simple enough to lend itself well to play with practically any audience and mix of skills. We’ll strongly recommend Hey, That’s My Fish here, with a black mark for the male gendering of pronouns in the instructions. There’s no need for communication during the game, and indeed it’ll only humanise your opponents. You want to be able to drown them with a clear conscience and silence will only help with that. We strongly recommend Hey, That’s My Fish in this category. The intersection of colour blindness and visual impairment is going to have a significant impact on the clarity of game state – we don’t recommend Hey, That’s My Fish for players with visual impairments but believe it’s possible to play if the will is there. Our advice to avoid the game would be strengthened considerably if there were colour discrimination issues to take into account along with visual impairments. For those with cognitive impairments, pretty much any compounding condition is going to take the tentative recommendations we offer for fluid intelligence and push them over into the ‘avoid’ column. Unusually, we wouldn’t necessarily be inclined to reverse our recommendations for those with physical impairments and communication impairments. The game doesn’t cleanly support verbalisation but it does permit for unambiguous play through exhaustive referencing with nothing more than a single repeated expressed signal. This could be verbal, physical, digital or anything in between. A tap of the finger for example can be used to select between penguins, between directions of movement, and number of spaces to move. While this is obviously less than ideal, it does ensure the game remains playable. At around ten or so minutes of play-time it’s not going to exacerbate issues of discomfort or distress. The drawn-out setup phase might be a problem if trying to keep people focused and interested on multiple sessions of the game. Setup is relatively laborious and not at all interesting, and can in many cases double the time investment required for play. That can be a hurdle for players with attention issues, especially given the fact that there are emotional considerations to take into account as a result of the player elimination model. I like Hey, That’s My Fish more than the review or teardown might imply, but the truth is we’re almost never going to take it down from the shelf. I’ve played many dozens of games of this, but the majority of that has been done on the app on my phone. The app neatly deals with the setup issue that plagues the game and gives it the room necessary to show itself off to its best effect. I know I’ve harped on about the setup a lot in both the review and the teardown, but it really has to be emphasised that for the time I spend setting up a grid I expect the game to last several multiples of the time invested. I’m happy to spend ten or so minutes arranging something like Merchants and Marauders because I know that’s what I’m going to be playing for a good chunk of my afternoon. The ratio of setup to satisfaction needs to be higher than it is with Hey, That’s My Fish and there are accessibility considerations that show why it’s important. With two and a half stars to its name, we find it hard to recommend that you buy this physical game. The game itself is fine – good, even. Sometimes though when you play a physical tabletop game you can’t help but yearn for the convenience of a digital implementation. It’s a bad sign when you’re sitting at a table with a game thinking ‘I wish I was on my phone instead’, but that’s the Hey, That’s My Fish experience in a nutshell.